How Should the Family Business Community Respond to the Challenge of Economic Inequality? In many segments of society there is growing pessimism about established business leaders’ ability to generate a sustainable and shared prosperity. Pessimists appear willing to embrace harsh solutions such as withdrawing from international trade agreements, building high walls against outsiders, or demanding aggressive tax increases on the rich. The distrust and suspicion of business is accentuated in the debate about economic inequality. Even as overall global wealth grows, the gap between wealthy and poor is widening (Piketty, 2014). One billion people now subsist on $1.25 per day and one in nine people cannot afford to eat every day (Oxfam, 2015). Meanwhile, the wealthiest 1% of people own nearly half of total wealth (Credit Suisse, 2014; Oxfam, 2015). These trends are now part of the new global economic reality and their trajectory will profoundly transform the economic landscape. Indeed, the World Economic Forum considers ‘deepening economic inequality’ as the number one item on its 2015 Outlook on the Global Agenda. 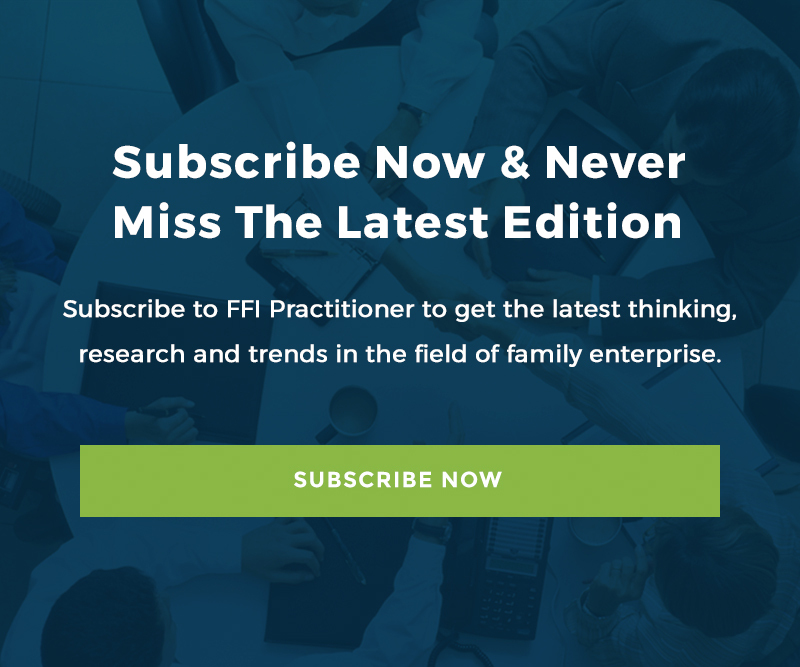 In this article we consider how family firms are impacted by economic inequality that is transforming society and describe how the family business community can respond to the challenge. In the backlash against economic inequality, the family business community is very much in the crosshairs of new policy proposals. Family firms are highly concentrated in the upper echelons of the wealth hierarchy as a full 75 % of the wealthiest 1% households in the United States own and actively manage a private business and 86% have passive private business interests (Carney & Nason, 2016). In respectable academic and policy circles there are growing calls for the imposition of a globally enforced annual wealth tax (Piketty, 2014). Families are specifically implicated in the concern that “inherited” rather than “merited” wealth is a significant contributory force in wealth inequality (Keister, 2005) with demands for the reinstatement of hefty estate taxes and proposals for a progressive lifetime capital tax for the recipients of inheritances and intra-family gifts (Atkinson, 2015). The public specter of conspicuous wealth and irresponsible ‘Rich Kids of Instagram’ provide welcome ammunition to the critics of inherited wealth. Beyond a potentially tarnished image, the inequality debate is transforming the environments in which family firms operate. Political parties and policymakers are responding to voters’ willingness to challenge elites. A variety of social movements are offering a collective voice to disenfranchised and marginalized populations. This ranges from non-profit organizations such as World Vision and Oxfam to activist groups such as Occupy Wall Street. The tone and implications of these social actors varies greatly, but will almost certainly evolve and play a critical role in the global narrative of adequate responses to wealth inequality. With a front row seat at this debate, family firms have options in terms of how they will respond to economic inequality. We outline four potential reactions. Family firms can bury their heads in the sand by retreating to safe spaces and sequestering themselves from these uncomfortable societal debates. Escapism can take the form of passive avoidance (“I don’t want to get involved in that thorny issue”) to active disdain (“I don’t owe anyone anything, I worked hard for my wealth.”) While there may be some truth to the sentiments, avoiding meaningful interaction on the topic is unlikely to engender support or proactively incorporate societal changes into strategic decision-making. A more pragmatic approach is what we call dead money. Dead money strategies seek to conserve and preserve wealth, by locking it up. Many estate planning and financial service instruments are designed with this aim including wills, trusts, and even some foundations. While these instruments may indeed preserve wealth, they also come at the cost of restricting the productive use of wealth to new ends. This is the reason why such tools have been described as “mortmain” or the “dead hand” — ancestors reach beyond the grave by continuing to influence how family assets are managed. It is also why common law countries outlaw such perpetuities. Dead money strategies may successfully preserve wealth today but reduce the autonomy of the rising generation to respond to the challenges they confront tomorrow. At the other end of the reaction spectrum is completely giving away family wealth, what we term extreme philanthropy. Extreme philanthropy is perhaps best exemplified by Andrew Carnegie and his “Gospel of Wealth.” In this seminal writing, Carnegie makes the moral case for the wealthy class to bequest assets to philanthropy rather than pass on to heirs. He argues that this approach does greater societal good and serves to explicitly address inequality. Strategies to address wealth inequality need not only be purely redistributive. We refer to market-driven solutions as engaged capitalism. A growing stream of research has argued that market failures and changing macroeconomic trends such as inequality present opportunities for business thinking to be harnessed for social advancement. For instance, there is a vital need for services that meet the needs of base of the pyramid populations (Prahalad; 2006). Family firms can leverage expertise to play a proactive role in bringing critical services to disenfranchised markets in economically viable ways. The trend of social entrepreneurship – drawing on business techniques to address societal problems – provides an outlet for expansion and the engagement of socially conscious rising generation family members. Family businesses may find opportunities to diversify into emerging markets and utilize family values to advance societal good. So far the ire of the policy community and social movements has been directed toward Wall Street and avaricious CEOs of public corporations. However, the facts of economic inequality and family firms prominent position within the 1% make this a challenge that the family business community cannot ignore. The question is not whether inequality is an issue but how the family business community should respond. As advocates for the family business community, we believe that it is helpful to document and articulate the important contributions of family business to economic prosperity. Our research shows that indeed family firms are highly concentrated in the upper echelons of the wealth hierarchy and that a few have benefited from inheritances and trust funds. But, for the most part, these firms are founder owned and managed, and wealth is highly concentrated in their firms. This is wealth that is invested in assets that are being put to productive use as well as generating employment with associated tax contributions to the local community. However, in the current environment of pessimism and mistrust of business leadership, public proclamations about family business contributions may be interpreted as self-serving. To ensure the stability, progress, and sustainability of the business domain requires an ethos that goes beyond self-interest and the calculation of economic contribution. As an antidote to pessimism, we propose a more fundamental shift in the family business community toward an ethos of virtue. The idea of virtue recognizes that there are real differences in ability and capacities for wealth generation. However the inequality of entrepreneurial capacities need not generate suspicion and mistrust. The virtuous performance of business entrepreneurship is derived from an ideology of post-liberalism that seeks to combine family-centered enterprise, community, and patriotism, with an internationalist outlook. This is a vision of solidarity and conservation that is concerned with greater economic justice and greater cultural cohesion that moves society beyond the current crisis of mainstream politics (Milbank & Pabst, 2016). For family firms, this means responding wisely to the challenges posed by inequality. We suggest that expressing an ethos of virtue will lead the family business community to embrace responsibility and promote engaged capitalism. This approach draws upon family firms’ orientation toward long-term commitments and rootedness in community. A virtuous ethos also shifts the way that family firms view themselves – as not just a business entity, but a business family with values, resources, and an entrepreneurial spirit that can be employed for inclusive prosperity across generations. Virtuous business families do not simply hand on economic assets, rather they shelter and nourish capabilities to create lasting social and economic value. Senior generation members pursue a second career in philanthropy, and next generation members seek meaning in their work by developing new models of social enterprise. Virtuous business families put dead money to work and invest in meaningful and inclusive growth. This is not to say that business families do not already harbor a virtuous ethos. However the coming challenge of inequality might foster a defensive posture animating escape or other extreme positions. This would be a mistake. As part of the economically advantaged, business families enjoy privileged opportunities to contribute real solutions to wealth inequality. In the spirit of family, community, and enterprise, business families better serve as change agents for an inclusive and prosperous social order. It is with these proactive and virtuous strategies that business families should thrive in the next decades and help to transform society for the better. However, many US states are reintroducing perpetual trusts (see Sitkoff & Schanzenbach, 2005). *Acknowledgements: We are grateful to the Business Families Foundation for its support and insights on this topic. Atkinson, A. B. (2015). Inequality: what can be done? : Harvard University Press. Carney, M., & Nason, R. (2016). Family business and the 1%. Business and Society. Credit Suisse, 2014. Global Wealth Report 2014. Credit Suisse Research Institute. Keister, L. A. (2005). Getting rich: America’s new rich and how they got that way. New York: Cambridge University Press. Milbank, J., & Pabst, A. (2016). The Politics of Virtue: Post-liberalism and the Human Future. UK: Rowman & Littlefield. Oxfam. (2015). Wealth: Having it all and wanting more. Oxford, UK: Author. Piketty, T. (2014). Capital in the 21st Century: Harvard University Press, Cambridge. Prahalad, C. K. (2006). The Fortune at the Bottom of the Pyramid. Pearson Education India. Sitkoff, R. H., & Schanzenbach, M. M. (2005). Jurisdictional Competition for Trust Funds: An Empirical Analysis of Perpetuities and Taxes. The Yale Law Journal, 356-437. Michael Carney, PhD, is a professor of management and Senior Concordia University Research Chair, Management in the John Molson School of Business at Concordia University in Montreal. A presenter at the 2016 FFI Global Conference in Miami, he can be reached at [email protected]. Robert Nason, PhD, is an assistant professor of management in the John Molson School of Business at Concordia University. He is co-author of From Longevity of Firms to Transgenerational Entrepreneurship of Families: Introducing Family Entrepreneurial Orientation. Rob can be reached at [email protected].